The glazed link was designed to provide smooth continuity between two adjacent buildings that were to form part of the same dwelling. One of the difficulties that needed to be overcome was the link needing to be constructed with a 135 degrees turn in both the glass roof and the side screens whilst still maintaining water tightness and smooth lines. 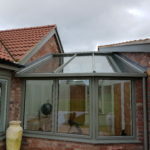 This was resolved through the use of the integrated Wendland Roofing System to form the glass roof, Senior SPW600 aluminium frames powder coated with dual colours (Olive green externally and pure white internally) and the installation being glazed with Pilkington Suncool 6040 to minimise internal solar gain . In addition the glazed link was designed to incorporate a 54mm solid oak door manufactured by a local specialist joinery company.. 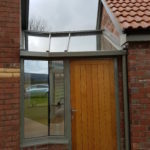 The complete glazed link was finished using seamless aluminium rainwater goods, trims and cills, that were specially manufactured by a local aluminium fabrication company.